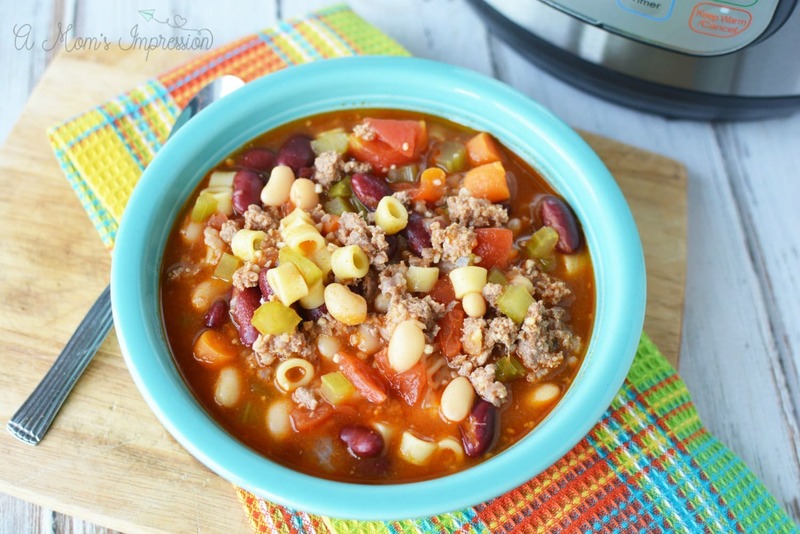 An Instant Pot Olive Garden Pasta Fagioli recipe that tastes like the traditional Italian pasta Fagioli recipe we all love but ready in minutes. I can’t get enough of Italian food. 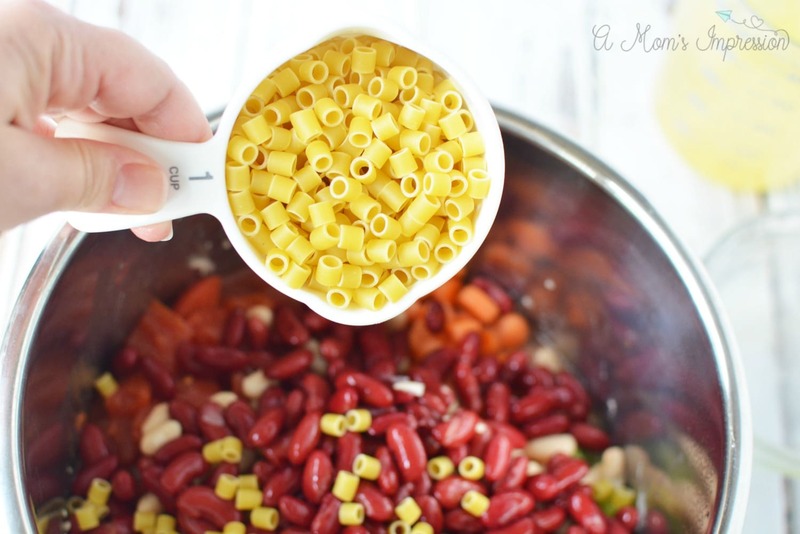 Pasta has always been my absolute favorite and soups with pasta are also high up on the list. 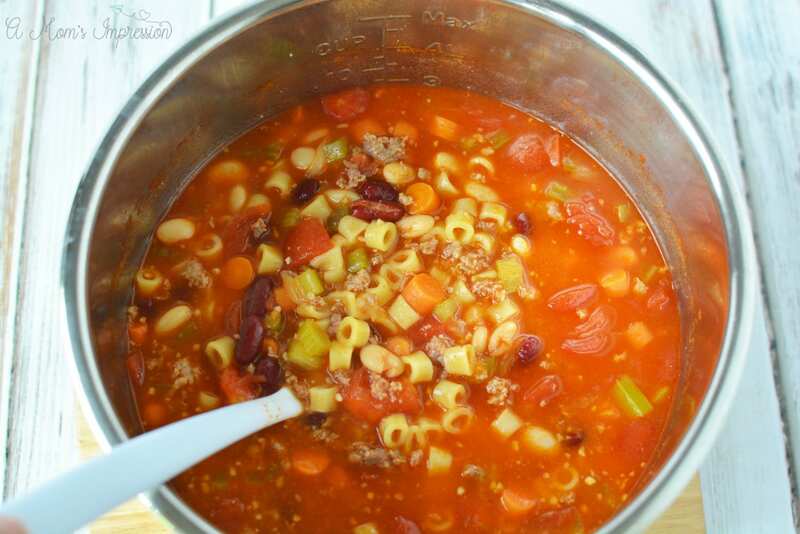 Have you ever tried the traditional Italian pasta Fagioli recipe at Olive Garden? It has everything that is comforting about soup right in one little bowl. 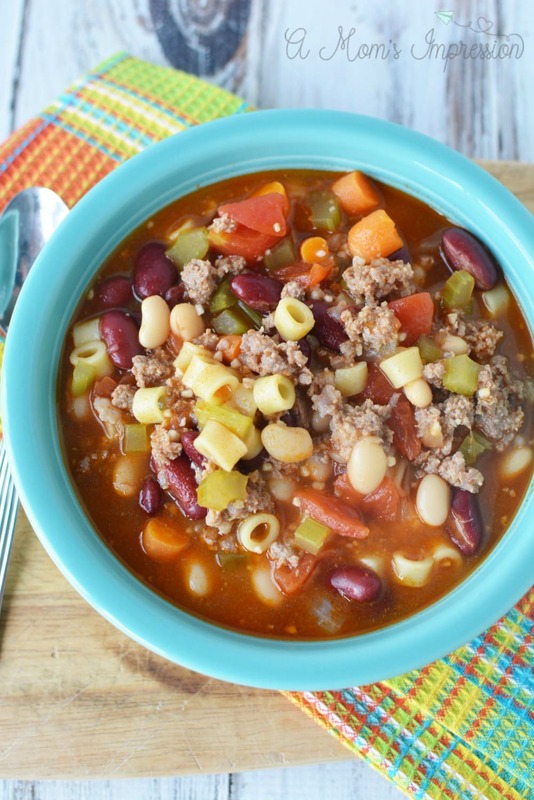 Pasta Fagioli has sausage, carrots, celery, beans, and pasta in a rich broth that is not only great for fall but year round enjoyment. 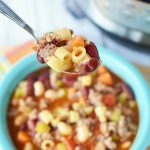 My Instant Pot Olive Garden Pasta Fagioli tastes just like the traditional version that we all love! I’m on this Olive Garden soup kick at the moment and have been remaking some of my favorites in my pressure cooker. So far I have recreated Olive Garden Chicken Gnocchi Soup and the Olive Garden Zuppa Toscana. 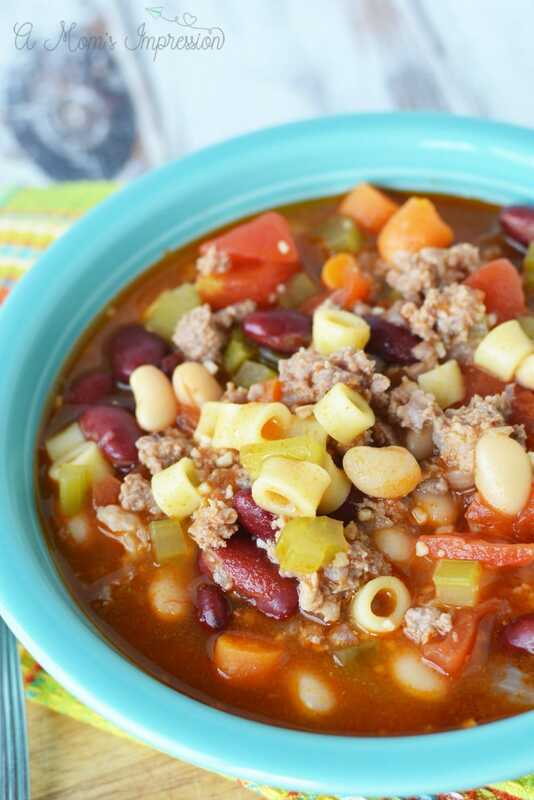 Our Olive Garden Pasta Fagioli rounds out this trio of amazing soups. Instant Pot Recipes are perfect for busy parents. 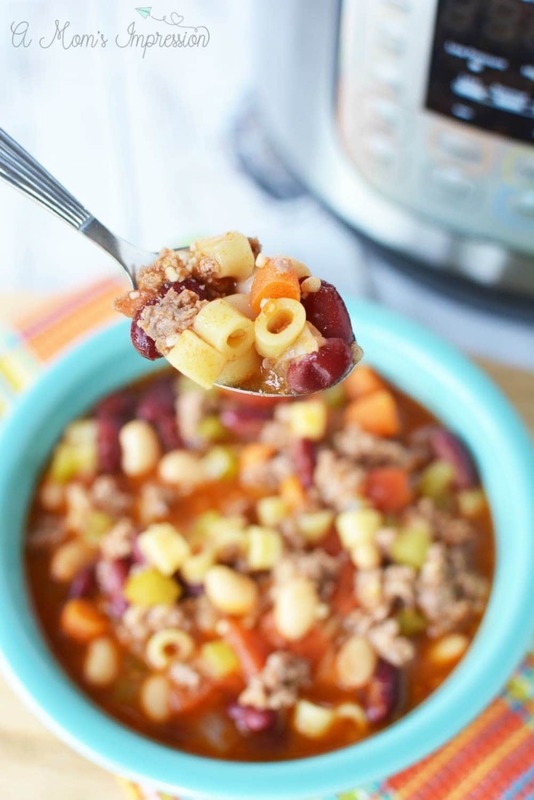 Cooking with a pressure cooker is timesaving and allows families to get a delicious meal on the table in minutes with a one pot cleanup just like this Olive Garden Pasta Fagioli recipe! Add ground turkey and sausage to the Instant Pot and saute until meat is browned. Add onion and garlic and saute for another 2 minutes. Place the lid on the instant pot and seal shut. Close the pressure release valve. Set the instant pot to manual, high pressure for 3 minutes. When the cooking cycle is complete, let the soup naturally release for five minutes before quick releasing steam. Open the lid and serve the soup immediately. I followed the recipe and this was great. Thanks for a wonderful dish. I am so glad you liked it! Enjoy! Made this soup last night. It was the first thing I made in my new Crockpot Express and it turned out perfectly! Delicious!! That is wonderful! Thank you so much for sharing! This was a hearty delicious meal enjoyed on a cold winter day in Wisconsin. Nice thing about it is that it is very flexible. I didn’t have great northern beans, so I just skipped them. Didn’t measure broth, added in extra elbow mac (did not have the other type of recommended pasta). It was wonderful! Definitely will be making again and again! Thanks for the recipe. This is wonderful! I love the flexibility of this recipe. I don’t think you can go wrong. Thank you for letting us know about your experience. Just made a couple of minor changes. We don’t care for ground turkey so used diced chicken. Added about 1/2 tsp red pepper flakes. Other than that, just listened to my 100% Italian husband to tell me how great this is. We love it! Thanks! I’m so glad your family loved it as much as we do.